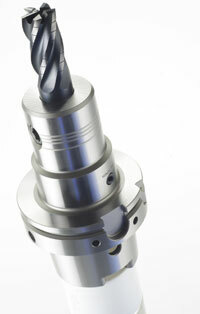 Gewefa face and taper toolholders – extensive range for high precision, heavy duty machining. The Gewefa family of face and taper toolholders is one of the most extensive available and now covers BT and DIN formats in SK30, 40 and 50 tapers to offer comprehensive capability for heavy duty and very high speed machining applications. Gewefa face and taper toolholders are available as collet chucks, shell mills, face mills, shrink clamp, hydraulic chucks and in extended length and adaptor formats. 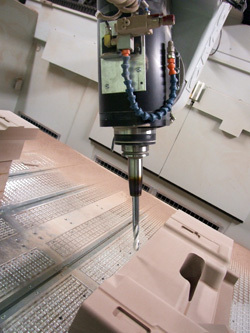 Although a specialist technique, machining using face and taper toolholding technology comes into its own when metal cutting in applications where side thrust is a possibility – typically heavy duty milling operations. Here, side deflection could be detrimental to precision and consistency of cut. In such circumstances the rigidity of the spindle/toolholder connection also impacts positively on longer insert life. Toolholders of this format also offer sustained precision and resistance to deflection when machining using extended length or overhanging tools and in processes such as deep pocketing or deep hole boring. A Gewefa face & taper toolholder fitted in a suitable spindle offers two mating surfaces – on both the gauge line (taper) surface and the horizontal flange face surface. For further information contact the sales team at Gewefa on 01225 811666, or email sales@gewefa.co.uk. Gewefa GmbH, the parent company of Corsham based Gewefa UK Limited will be exhibiting a range of toolholding products and systems at the forthcoming AMB exhibition in Stuttgart, including a debut for a new concept of hydraulic chuck toolholder designed for turning applications on multi-task machines. Gewefa offers an extensive range of hydraulic turning tool holders but the new system has added advantages in terms of ease of clamping/unclamping and the elimination of the need for gauging. As a general principle, hydraulic turning tool holders offer exceptional dampening qualities giving extended tool life and improved surface finish when used in conjunction with standard carbide tipped tooling or for hard turning applications. These features are particular highlighted with the new Gewefa hydraulic system which also benefits from an ergonomic one turn tool clamp and un-clamp release actuating screw, as opposed to the three or four clamp screws required with conventional ‘mechanical’ turning tool-holders. The customers square turning tools are modified to an h6 cylindrical shaft with the addition of a small clamping flat which is machined relative to the orientation and height of the turning tool insert. As a consequence no gauging is required. 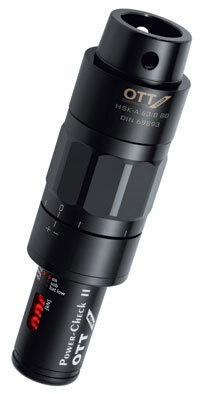 The new system is available with HSK-T location and VDI, with the options of both axial and radial versions. Finally, also at AMB will be a number of Gewefa UK’s technical partners exhibiting a range of products and systems allied to tool holding and ranging from collets to driven tools and spindle monitoring devices. EWS are in Hall 3 – stand 3B20; Simon Nann in Hall 1 – stand 1C78 and OTT-Jakob on the Gallery at stand 1Z112. New from Pibomulti is the 360° Auto Adjustable Angle Head, creating a highly innovative facility to implement 360° orientation of a right angle head in either internal or external machining operations. 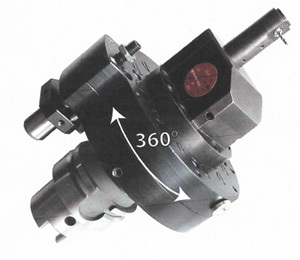 The 360°Auto Head has a pneumatic clutch mechanism built into the location device of the angle head. 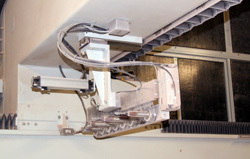 This allows the device to be unclamped and orientated to any radial position required by rotating the machine spindle. When the air is released the angle head is then clamped and ready the start machining. In effect one 360° Auto Head replaces the need for additional heads set at various angles and enables drilling in any radial position. Advantages are reduced cycle times, fewer angle heads, continuity of process and high accessibility for machining in awkward locations. Pibomulti specialises in all types of angle heads, spindle speeders, multi-spindle heads and turret heads with the extensive range available exclusively in the UK from Corsham based Gewefa UK Ltd. Continuing Gewefa’s long history of toolholding innovation it has now developed a new shrink collet system – the Induterm M96 - based on the proven heat shrink clamping technique so popular for securing milling cutters into tool holders. As well as exceptional grip with a very short clamping length the system offers high flexibility and accuracy with assured tool run out of less than 3 microns. It is a highly cost effective solution with the shrink collets being totally compatible for use with existing toolholders, whatever the format. UK engineers visiting EMO will be able to view at first hand a range of new product introductions from the partner companies of Gewefa UK Ltd, all of whom the Corsham based toolholding specialist exclusively represents in the UK. Gewefa GmbH is a toolholding innovator and in recent times has introduced exclusive equipment such as the Gewefa-Plus face and taper toolholder, the Hydropin hydraulic chuck with a fixed stop pin and the EasyFix boring bar toolholder. All will be featured on the Stand (Hall 5:B93) alongside a new shrink collet system – the Induterm M96 - based on the proven heat shrink clamping technique so popular for securing milling cutters into tool holders. Static and driven tooling specialist EWS (Hall4:G83) is supporting the German Industrie 4.0 initiative based on a smart manufacturing and integrated production concept. EWS has developed a new intelligent driven tool (as yet un-named) which includes sensor technology enabling it to communicate with the machine operator or even with the machine itself. 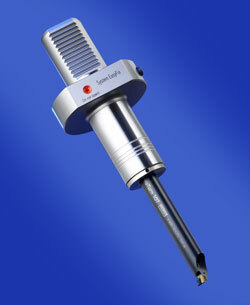 The technology will be able to monitor the cutting conditions, the runtime and also the sealing conditions of the tool. EWS’s aim in introducing the tool is to create the ability to communicate with the operator in order to alert or remind him of any impending maintenance or replacement procedures in advance of obvious visible warnings or a drop in performance. Pibomulti, (Hall 4:A27) the Swiss angle heads, speeders and multi spindle head specialist is introducing the Pibomulti ‘Rainbow’ range of right angle heads that are assembled on a modular concept. In effect, a customer can specify a head to precisely meet a specific machining requirement and the capability of the machine it is fitted to. Pibomulti then assembles the bespoke head in a very short lead time and can supply it in a range of distinctive colours. On the OTT-Jakob stand (Hall5:F14) a new sensor based 3-in-1 monitoring solution will be making its debut. This in addition to the design-optimized Power-Check 2 device for measuring the toolholder pull-in force on the machine tool spindle. ‘MSU’ is OTT-Jakob’s new ‘plug & play’ monitoring system which will increase the efficiency of factory networked production by obtaining machine state data using electronic sensor technology. OTT-Jakob has two decades of experience in sensor integration into tools. Its new MSU multi-sensor unclamping unit is an innovative solution that groups up to three control functions into one unit; the monitoring of the position of the drawbar shaft, detection of the position of the unclamp body and optimum leakage detection. There are also new developments for the Power-Check 2 pull force measurement device. A hands-free unit with data accessed from outside the machine, Power-Check 2 now incorporates a new locking function on the adjusting sleeve and has a new sealing system. Also new is a coating for wear protection that acts as a reliable and permanent protection against rust. Simon Nann (Hall4:C09) will be majoring on their expertise as a leading supplier of standard and special collets while Rineck, the supplier of heat shrink clamp machines (Hall5:A53) will be featuring its latest ‘rapid shrink VCS’ bench top model. Gewefa has developed a unique hydraulic chuck for holding Sandvik Coromant EasyFix® boring bars that removes the need for reduction sleeves while eliminating run out and guaranteeing the centre height at the insert cutting tip. Setting time is substantially reduced – by as much as 75% - with the Gewefa design featuring a spring plunger mounted in the toolholder body. This locates into a fine groove machined into all Sandvik EasyFix boring bar shanks and aligns the bar position precisely for the correct centre height. Along with the hydraulic chuck operation, a secure grip is guaranteed with integral anti-vibration damping to optimise the machining process. By eliminating the previously accepted method of securing boring bars into a toolholder with reduction sleeves, the opportunities for inaccuracy and bar deflection during boring operations are now greatly reduced. 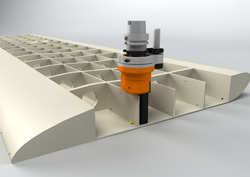 Gewefa also offers a system for other proprietary systems with the ground angle on the back end (of the bar) locating against a stop pin at the base of the toolholder. This ensures precise central positioning and orientation with the bar then locked into the hydraulic chuck. The advantages of all systems is a 50% increase in cutter life due to the more secure, vibration-free grip, guaranteed repeatability when changing like-for-like bars and a simple, fool proof fitting process. Gewefa offers the hydraulic chuck for ARNO, System Dieterle, DTS/HOBE/MAS/SUMITOMO/SANDVIK/ SIMTEK and VARGUS screw orientation options along with other systems. For further information contact the sales team at Gewefa on 01225 811666 or sales@gewefa.co.uk. The newly introduced Gewefa Grindtec range of hydraulic chuck toolholders are purpose designed to work with bespoke tool grinding machines and feature a mechanism that enables adjustment of the run out at the tip of the (clamped) cutter to zero tolerance. This is achieved by compensating for run out errors between the tool tip and the spindle with the cutter adjustment via three 120º radial screws located in a ring fitted around the toolholder body. The cutter shank is thus slightly deformed to achieve absolute accuracy of its position at a distance 100mm from the ring. As a consequence all run out errors can be eliminated from the tool tip to the spindle. On the Grindtec, the radial adjustment screws are protected by a cover ring that clips into position after the adjustments are made. Another important feature of the Grindtec is the design of the outside form which permits machining close to the cutter when used on grinding machines. In long run batch machining operations the need for repeatable accuracy puts a great onus on key machine tool components – none more so than the spindle. Degradation of internal components such as spindle bearings and the spindle pull back mechanism will impact over time on sustained precision of the workpiece being machined, in the same way as tool wear. As such, spindle performance monitoring becomes essential in such environments. Now, a newly introduced spindle pull force measuring gauge – the Power-Check Magazine - is available from the German manufacturer OTT-Jakob and available in the UK from Gewefa UK Limited. 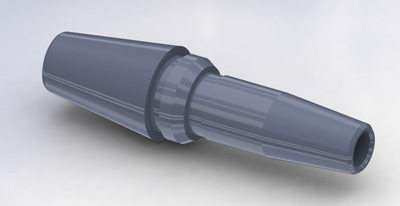 The Power-Check Magazine features an integral ultra slim pencil design suitable for small machine tool spindles - for example HSK32 - and a short gauge line which can be used in an automated manufacturing cell where preventative maintenance and continuous monitoring of the spindle pull-back mechanism is essential. 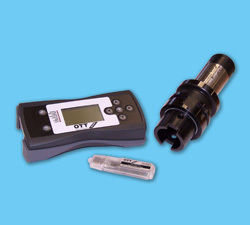 The Power-Check Magazine is located in the tool carousel (as with a conventional toolholder) and when tool changed into the spindle automatically transmits spindle taper retention readings to a remote receiver via a wireless connection. As well as taking readings from machines involved in high volume, continuous machining operations, the new Power-Check magazine is also suitable for use in automotive and aerospace FMS systems where accessibility could be an issue. Reduced or diminished clamping forces can have a long-term negative impact on machining precision and the machine tool itself. Consequences can be poor surface quality due to vibrations, increased tool wear, shorter tool life spans and even breakage. 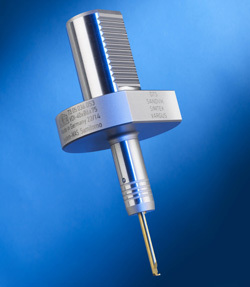 Other outcomes can be spindle taper corrosion caused by micro-movements, machine downtime and risk of operator injury. The receiver for data sent by the Power-Check Magazine is called the Power Monitor. Using the software supplied, measurements from multiple transmitters can be displayed and saved in real time. The Monitor runs on batteries, allowing it to be used anywhere and thanks to its user-friendliness, data can be retrieved easily and with no complicated processes. Data can also be transferred to a USB radio stick used in conjunction with a lap top to wirelessly transmit data from the Power-Check Magazine. It is able to receive data from numerous units, enabling the user to record and tabulate the readings relative to each individual machine tool. Gewefa UK debuted an innovative new high security toolholding concept at MACH while using the opportunity to present the latest products from its five specialist partners. The new Gewefa ‘Venturi’ toolholder concept is a universal tool clamping solution that incorporates safety and adjustment features from three of its proven designs plus a unique thro coolant capability. It has been designed primarily for aerospace applications where arduous, precision machining using challenging materials is becoming increasingly commonplace. By combining the established features of a hydraulic toolholder with ultra-safe Gewefa Securlok clamping, the side accessed precision Radax adjuster and now the coolant feature, Gewefa believes it has created a truly unique combination. The Radax features permit high precision pre-setting – even on the machine – using an externally accessible worm gear mechanism which is now complemented by the new Venturi cooling. This offers coolant from two sources - one directed along the tool shank with a second flow via angled jets incorporated into the front of the tool clamping bore. 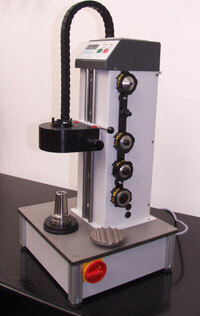 Another ‘first’ at MACH was the Gewefa single point boring bar toolholder – the ‘HydroPin’. This Gewefa invented toolholder utilises the proven tool grip features of a hydraulic chuck with the added advantage of guaranteeing fixed orientation when positioning the bar. By eliminating the previously accepted method of securing boring bars by fitting an adaptor reduction sleeve into a VDI mechanical boring bar holder the opportunities for inaccuracy and bar deflection during boring operations are now greatly reduced. Gewefa has five specialist partners in the UK and each show cased their latest products. Pibomulti introduced a new economical and energy efficient spindle speeder specifically for quick change, high volume tapping operations offering a halving of cycle times while producing a 90% saving in power consumption. Also from Pibomulti, its micro engineered right angle drilling head is ideal for drilling in difficult-to-access areas (such as edge walls) that are typically found in aerospace, automotive and hydraulic component manufacturing. 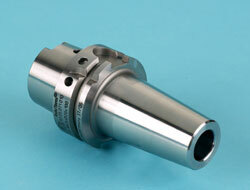 The unit can operate at up to 12,000rpm in even the most confined spaces and accommodate tools up to 6mm in diameter. EWS, the highly respected manufacturer of driven and static toolholders for CNC lathes has upgraded its quick change Varia modular toolholding system into Varia-VX, offering increased performance for turning and milling processes. Precise, fast and powerful, Varia-VX allows a maximum concentricity through the new three point locking system and triangular drive spigot which has a positive effect regarding high spindle torque. This characteristic is of particular importance where small tool dimensions are being used and also permits use at torques up to 200 Nm. Building on the initial success of its Power Check pull force gauge, OTT-Jakob now offers a mark III version of the unit that provides readings remotely via a handset, enabling the automated checking of the spindle pull-back force. Preventative maintenance can be carried out quickly and efficiently with the Power Check unit being housed within a nominated pocket in the machines’ tool carousel in readiness for the next spindle pull back reading. Featured from clamping technology expert Simon Nann GmbH was a modular quick change MZ manual clamping unit that converts the base unit from a conventional clamping head to a dead length collet system, a draw-back collet or for expanding mandrels. MZ offers versatility, being suited to double sided machining or machining of long parts (with a tailstock support). A simple key movement through 180 degrees converts the base unit from clamped to unclamped. Finally heat shrink clamping specialist Rineck introduced a new upgraded induction heating device for undertaking clamping and unclamping of tools in heat shrink toolholders. The vertical ‘elevator’ design permits a compact benchtop installation and the unit features automatic tool cooling for safety and consistency. Both carbide tools (Ø3 - Ø32) and HSS (Ø6 - Ø32) can be shrunk in the new 10Kw machine with all parameters, shrink times and performance data stored on the machine in its internal database. “MACH 2016 for Gewefa UK was a tremendous success,” reports managing director Keith Warner. “Initially the show started slowly, but by the Tuesday the enquiries were flooding in, exceeding our expectations significantly. The quality of enquiries and their potential value bolstered the feeling that visitors - both engineers and procurement personnel - had come with the intent of doing business,” he adds. All sectors including aerospace, automotive, the wider manufacturing scene and general sub-contract engineering were represented in those visiting the Gewefa UK stand and this included both existing and new customers, with significant orders being placed by both categories. Continues Keith Warner; “Great interest was shown in the new Gewefa Venturi Securlok chuck, with orders being placed by aerospace cutting tool suppliers and our aerospace end-users. “EWS driven and static tooling for lathes made up a significant proportion of the show enquiries, as did the Pibomulti range of speed increasers and angle heads. Other products under the Gewefa banner also stimulated great interest, offering great potential and projects for us to follow up and turn into orders. “It was a simple and straight forward decision for Gewefa UK Ltd to book a stand for 2018, the general opinion by ourselves and on speaking to fellow exhibitors was that this was the best promoted MACH exhibition to date,” concludes Mr Warner. Gewefa’s new toolholding system for single point boring bars utilises the proven tool grip features of a hydraulic chuck with the added advantage of guaranteeing fixed orientation when positioning the bar. Gewefa has introduced a unique toolholding system for single point boring bars that utilises the proven tool grip features of a hydraulic chuck with the added advantage of guaranteeing fixed orientation when positioning the bar. With the new Gewefa solution the bar shank is directly clamped into a hydraulic chuck with the ground angle on the back end (of the bar) locating against a stop pin at the base of the toolholder. This ensures precise central positioning and orientation with the bar then locked into the hydraulic chuck. The advantages are a 50% increase in cutter life due to the more secure grip, guaranteed repeatability when changing like-for-like bars and a simple, fool proof fitting process. The bar is precisely clamped at the all-important centre height by the hydraulic chuck clamping system which, with its vibration absorbing features, contributes significantly to improved surface finish and longer insert life. As with all Gewefa toolholders, it is a universal solution and to accommodate various manufacturer’s back end configurations of boring bar, Gewefa has introduced the toolholder with ARNO, System Dieterle, DTS/HOBE/MAS/SUMITOMO/SANDVIK/ SIMTEK and VARGUS screw orientation options. System ARNO is supplied with a 30 degree stop pin while system Dieterle has a 90 degree stop pin. The Pibomulti SA slim line angle head is particularly suited to machining in inaccessible pockets or hard to reach areas such as encountered in aircraft wing structures. The Pibomulti SA slim line angle head can machine very close to the structure wall. Just 1mm clearance is required between the edge of the drill hole circumference and the workpiece angle. 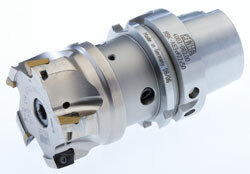 The latest in a range of innovative, high performance angle head tools from specialist Swiss manufacturer Pibomulti SA is a slim line head particularly suited to machining in inaccessible pockets or hard to reach areas such as encountered in aircraft wing structure machining operations. 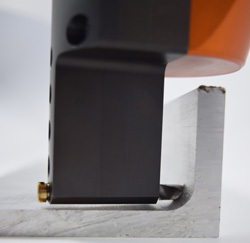 So precise yet slim line is the angle head design that if required it can be positioned to drill a structure with just 1mm clearance between the edge of the hole circumference and a right angle edge of the profile while avoiding deflection and maintaining full machining power. Pibomulti products are exclusively available in the UK through Gewefa UK Ltd of Corsham. 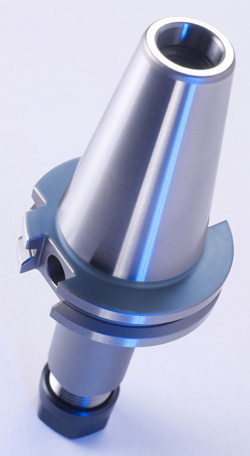 While the SLA angle head features a very slim machining head profile it maintains the features associated with Pibomulti special tools – high standards of manufacture, strength and reliability. SLA ‘standard’ heads are available in five variants offering different power (0.5kW to 2kW) and torque (1Nm – 8Nm) options. Cutter sizes of between 3 and 12mm diameter can be accommodated. However, bespoke designs to suit specific applications are a speciality of Pibomulti and they are happy to adapt heads to suit. Large continuous machining operations and transfer lines as experienced in automotive or high volume component manufacture are ever more dependent on machine reliability and data feedback to maintain performance and precision. Conditions at the spindle are all important and a new pull force gauge and read out system from Gewefa UK now offers the ability to monitor conditions at the spindle, particularly relating to wear or degeneration. 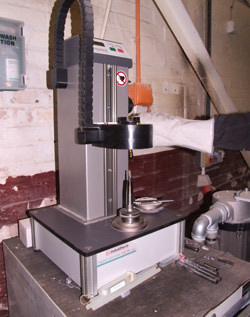 OTT-Jakob – who Gewefa represent in the UK – is a renowned manufacturer of pull force gauges and their Power Check model is a staple component with most machine tool maintenance engineers. The latest variant of the Power Check is however specifically designed to be left in the machine carousel to provide a point of continuous monitoring. Furthermore the connection to the hand held data collector is wireless so an operator can monitor data collected at the machine from up to eight different machine locations. Over 8,000 readings can be stored on the handset with these easily downloaded to a USB for transfer to a lap top or network computer system. Typically such readings could include machine id, date, time, precise pull force details and the adjusted range - so the operator has a full picture of the individual machine pull force status at his fingertips. Pull back degeneration at the spindle affects cutting performance and accuracy and if undetected for a period, can result in more extensive bearing damage in the machine tool itself. 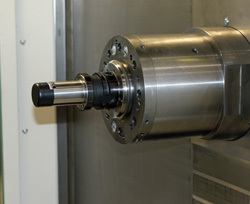 By dedicating a location in the carousel to the new Power Check Magazine, it can be programmed through the handset to monitor the spindle on a continuous cycle – weekly, daily, even hourly – with the readings safely recorded via the wireless connection from outside the machining area. 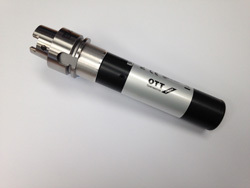 The OTT Power Check Magazine is a universal unit suitable for all types of spindle systems, regardless of manufacturer. The new permanent design features a shorter shank location and it is powered by a kinetic connection, activated through the carousel so no power supply or battery is required. 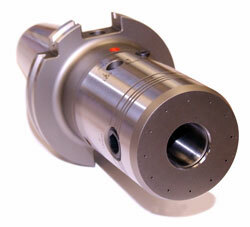 The unit can be used for all machine tool spindles with adaptors available for HSK, DIN, ANSI, and MAS BT. Two variants are available, one with a pull force of 10-75kN or an alternative unit for smaller machines with a pull force of 2-15kN. The remote reading feature has the benefit of eliminating any health and safety concerns due to the maintenance engineer or operator being situated outside of the machine and being able to record and appraise readings remotely and most importantly, safely. 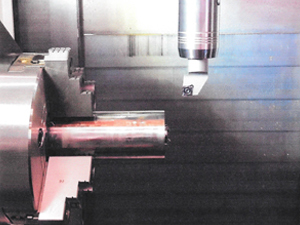 As part of a £3/4M investment programme in its prototype automotive styling and modelling facilities, Coventry based Visioneering Ltd has specified Gewefa heat shrink clamp spindle nose tooling for use on its new 5 axis machining centres. Visioneering has purchased two Ares Cms moving bridge machines to manufacture predominantly data control models used in styling and engineering structures of new and prototype production cars for the leading marques. Part of the Envisage Group, Visioneering Ltd is the UK’s leading designer and manufacturer of styling, engineering and data control models and panel checking fixtures for prototype and production parts. 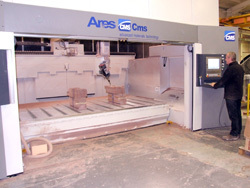 The Ares Cms moving bridge is a completely self-contained 5 axis CNC machining centre for a variety of composite, model board and light metal cutting applications. The working unit of the Ares moving bridge is a PX5 12kw (16hp) spindle, which lends itself to powerful high speed machining and which can machine 3 dimensional and other unusual surfaces and can also be utilized for intricate and aesthetic sculpturing applications. The machines in use at Coventry are required to run at up to 24,000prm with feeds up to 50m per minute. Tolerances are typically+/- 0·02mm. The decision to specify Gewefa heat shrink toolholders was based on the security and concentricity of the tool/cutter interface and the requirement for balanced, vibration free cutting. All of the Gewefa HSK, BT and DIN toolholders are supplied balanced and have a very slim profile – essential when machining deep pockets or in tight, inaccessible areas. “Virtually everything we do is a one off,” explains Visioneering operations director Adrian Coppin. “It is not unusual for us to re-visit a component a number of times for fine-tuning or minor but intricate modifications so the capability and manufacturing flexibility of the new machines in conjunction with the Gewefa shrink tooling system has been a very welcome addition to our capacity. 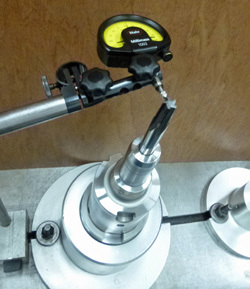 Five axis supervisor Keith Myatt was instrumental in recommending the Gewefa shrink cutter shank clamp system. As part of its investment Visioneering also purchased from Gewefa a heat induction unit – a bench top Rineck ‘Induktherm’ rapid shrink VCS - which has a 10kw high speed induction heater for rapid tool changing. The Ares machine has an automatic tool changer with a tool magazine located within the machine chamber which accommodates a full range of Gewefa HSK 63-F shrink tooling together with conventional spindle nose tooling including Gewefa extended slim line collet chucks and face mill adaptors. 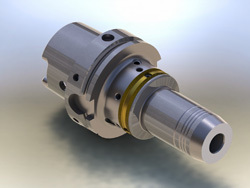 Tool holding specialist Gewefa UK has developed an innovative 'centering' feature for its hydraulic face mill adaptors that further enhances the all-important location of the cutter in the adaptor resulting in increased insert life, particularly noticeable in volume manufacturing environments. The location is around the spigot of the face adaptor which centralises the face mill cutter to a precise, even tolerance ensuring uniform chip load on each edge of the cutter and in the process increasing insert life and improving surface finish. It is operated by the one screw. As well as this precision tolerance location there are also enhancements in the anti-vibration damping features which impact on improved surface finish. Comments Gewefa UK managing director Keith Warner; "Customers undertaking face milling operations in high volume environments have noticed improved insert life since adopting the new design. Indeed some have reported increased tool life as high as 50% as well as improved, smoother running and a quieter mining pass. "There is a great loyalty to the hydraulic holders across the milling sector. Its integral active vibration damping and high torque clamping well proven features for all types of machining. Now, where there is a need for extra precise cutter location, this new feature opens up the possibilities for applying hydraulic face mill adaptors in volume manufacturing in a highly cost effective way". For further information on this and the full range of tool holding solutions available from Gewefa UK call the sales team on 01225 811666. Heat shrink clamp and hydraulic toolholders involved in milling and drilling operations on advanced technology composite wing components in the GKN Aerospace Western Approach facility in Severn Beach, Bristol have been custom manufactured by Gewefa UK Ltd based in nearby Corsham. GKN Aerospace is one of the world’s leading first tier suppliers of aircraft structures, components, assemblies and engineering services to the global aviation market and is the leading independent supplier of composite structures. As part of its strategic development, the company has established a market leading, highly automated manufacturing and assembly facility at Severn Beach, near Bristol, UK. This facility is responsible for the production of the complex, 27m long composite rear wing spars for the A350 XWB and the assembly of the aircraft’s wing Fixed Trailing Edges (FTE). The site also manufactures the composite wing spars for the A400M military transporter. These nearly 20m long wing spars represent the first primary wing structures for a large aircraft ever to be created entirely in carbon fibre reinforced plastic (CFRP). The A350 and A400M wing spars are machined on two Flow Composites Machining Center’s supplied by Flow Waterjet Europe. These offer complete parts processing from autoclave to assembly with the integrated manufacturing process involving abrasive water jet cutting followed by high precision milling of the datum faces on the outer mould line along with drilling of the fastener hole patterns and routing. Gewefa HSK 63A shrink clamp toolholders are the preferred toolholder for the milling operations offering the proven high rigidity and grip on the cutter shank necessary in these challenging machining operations. The hydraulic chucks are used for drilling the fastener locations. Importantly though, because of the hostile (wet) cutting environment it has been necessary to manufacture the toolholders from corrosion resistant materials. In Gewefa’s manufacturing plant in Burladingen, Germany, the preferred option was a stainless material which offers the combination of corrosion resistance coupled with the material characteristics necessary within the toolholder - namely extreme heat followed by rapid contraction to accurately and concentrically secure the cutter. As a preferred supplier of toolholders to GKN Aerospace, Gewefa has numerous shrink clamping installations in its manufacturing facilities around the UK. At Western Approach Gewefa has also supplied a comprehensive package of equipment to support the tooling operations on the Flow machining centers. It has supplied a free-standing Rineck shrink machine with separate cooling unit, a tool balancing machine, a Parlec 1500 bench top tool pre-setter and a range of storage cabinets for toolholders and toolroom equipment. The Flow milling "C" and "B" axes and live spindles each incorporate precision certified direct coupled feedback to ensure extremely accurate positioning for drilling of fastener holes ready for assembly, or for precise surface milling and routing. With the machines having maximum cutting speeds of up to 30,000rpm, all of the Gewefa toolholders are supplied balanced with the on-site balancing machine enabling GKN Aerospace technicians to optimise the balancing of the toolholder together with the cutting tool. This facility ensures monitoring and correct balancing to ensure exceptionally accurate and consistent part quality. Keith Warner, managing director of Gewefa UK Ltd comments: “This is a great testimony to Gewefa’s standing as a preferred toolholder supplier to GKN Aerospace. Heat shrink clamping remains a very popular method of securely fixing and releasing cutters in toolholders and the technique has long been a specialisation of Corsham based Gewefa UK. Now, with their latest range of heat shrink machines, Gewefa has rationalised its ‘RapidShrink’ machine options available to customers while offering a new range of dual purpose machines. Manufactured by Rineck GmbH who Gewefa represent in the UK, the new range of three machines comprises two re-designed dual purpose vertical bench top machines capable of shrinking both HSS and carbide cutters and a free standing top of the range machine with an automatic cooling system. The top of the range free-standing ECS unit is a 10kw unit with heavy duty induction generator and coil designed for shrink clamping carbide and HSS tools in high use environments. Shrinking times on the ECS are between 3 and 9 seconds and once completed the toolholder/cutter combination is automatically immersed in a coolant tank for a pre-selected cooling period. Being wheel mounted the complete cabinet assembly can be moved from machine to machine in the workshop. Across the complete new range adaptors are available to convert the machines between HSK, DIN and BT shrink toolholder formats. Having unveiled the working prototype of its new hydraulic side lock toolholder at the MACH 2012 exhibition, customers are now purchasing Gewefa UK’s 100% secure chuck following the completion of extensive production trials. Branded the ‘Gewefa Securlok’*, the toolholder is essentially a hydraulic chuck design that, with the addition of a second mechanical side clamping mechanism, provides 100% tool shank and process security. It is ideal for general and heavy duty milling operations in titanium, composites and ISO S rated materials often used in airframe manufacture and where there are substantial radial and axial forces on the cutting tool. These forces are likely to create conditions with the potential for the cutter to slip or pull out. More importantly ‘Securlok’ offers a guaranteed concentricity - within 0.003mm TIR maximum - providing uniform chip load on each cutting edge for longer cutter life. Unlike some, the ‘Securlok’ offers a totally enclosed clamping unit which prevents any possibility of swarf or coolant entering the hydraulic chuck mechanism, potentially causing internal damage that could necessitate costly servicing and putting the toolholder out of action. Importantly, the Gewefa toolholder is suitable for use with standard cutters machined with a Weldon flat (DIN 1835 Form B) or a Whistle Notch (DIN 1835 Form E) connection. This makes the ‘Securlok’ a genuinely universal toolholder whereas other manufacturer’s designs require special grooves to be machined into the cutter shank which restricts the customer to using cutters available only from the toolholder supplier. With its slim nose design the ‘Securlok’ is finding particular favour in aero frame machining applications where demanding surface finishes and high removal rates are all important. 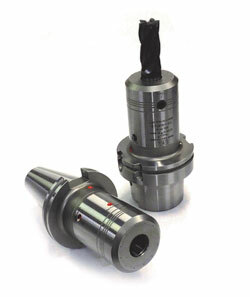 In these environments the anti-vibration characteristics of the hydraulic chuck come to the fore, when the consequences of heavy radial or axial loads particularly when milling can cause slip or vibration (causing tool ‘chatter’) and contributing to poor surface finishes and reduced insert life. The chance of the cutting tool shank slipping or pulling out applies to any friction based securing arrangement ranging from roll type milling chucks to shrink toolholders, hydraulic chucks and collet chucks. Suitable for milling and drilling in normal and heavy duty conditions, the ‘Securlok’ is very operator friendly with both locking operations undertaken with a single ‘T’ wrench. As phase one of its introduction, Gewefa has introduced toolholders in HSK, DIN 69871 and BT formats. * Gewefa Securlok is a registered trade mark. Can you feel the force? New OTT Power Check gives you the full picture! Building on the initial success of its Power Check pull force gauge, German manufacturer OTT-Jakob has now introduced a mark II version of the unit that is more compact and has a range of new features. Power Check is used for checking the force at which a tool is pulled into the machine tool taper, providing precise levels of diagnostic data that could prevent a fall off in machining quality or even complete spindle failure. Since its introduction many of the service teams working for leading UK machine tool manufacturers and distributors now use a Power Check as part of their essential maintenance procedures, enabling remedial repairs before a major breakdown. The new Power Check II is more compact than its predecessor enabling use in confined spaces or on machines with a smaller capacity chuck. It features a new gripping channel for automatic changing and gripping of the tool magazine, an automatic mode and an energy saving feature to save and prolong battery life. Ideal for service engineers and those maintaining large machine shops, the Power Check II stores data on up to 8,000 measurements - for example machine id, date, time, precise pull force details and the adjusted range - so the operator has a full picture of the individual machine pull force status at his fingertips. This latest version of the unit also features a download facility onto a USB device. Equipment from OTT-Jakob Spanntechnick GmbH is available exclusively in the UK from Corsham based Gewefa UK Limited. In addition to pull force gauges, OTT is a long established supplier of equipment such as power drawbars for ISO and HSK spindles, clamp and unclamp units and rotary unions. Claims Gewefa UK’s managing director Keith Warner, “establishing the precise pull force has always been something of a black art but now, with these OTT instruments that work to an accuracy of 0.1kN, when an engineer is undertaking a machine tool service he can provide the customer with its complete and totally accurate pull force status. “We envisage the ‘power check’ being of equal benefit to machine tool service engineers as to those operating larger machine shops. Frequently a fall off in performance or symptoms such as poor surface finish are regarded as tool holder or insert problems. All too frequently the problem may be more deep rooted and the OTT instrument can very quickly diagnose if the problem is spindle related. “The beauty of the instrument is the engineer can show the customer the read out and compare it with earlier readings. The customer can then decide on a course of repairs or remedial action should they be deemed necessary,” he explains. The OTT power check is a universal unit suitable for all types of clamping systems, regardless of manufacturer. Battery powered by a 9v DC battery, the unit can be used for all tapered standards with adaptors available for HSK, SK, ANSI, BT and MAS. Two versions are available, one with a pull force of 10-75kN or an alternative unit for smaller machines with a pull force of 2-15kN.